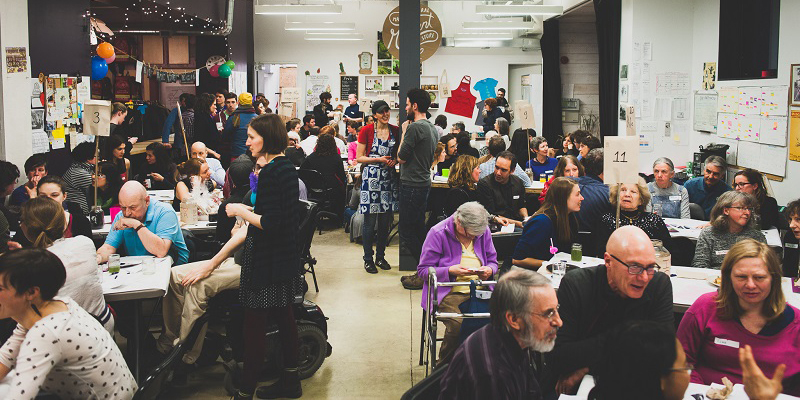 Just like the plants that we grow on rooftops and the volunteers that sustain our activities, Santropol Roulant itself is a dynamic and living entity, an intergenerational community, a beautiful mosaic of people of all ages and cultures, all brought together by food and community engagement. Anyone who received a meal in the past year. Anyone who volunteered in the past year. Anyone who contributed financially in the past year. Anyone who has been an intern or employee in the past year. 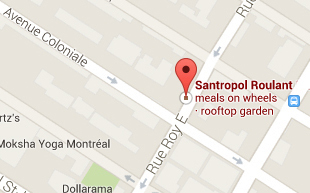 Santropol Roulant is a membership-based organization. As an organization that sees people as gifts, we naturally believe that our closest stakeholders and participants should have a say in how we operate. At our Annual General Meeting, these members play the vital role of electing the nine members of our Board of Directors, the latter being the ultimate guarantors of objects and policies of the Roulant. To illustrate our democratic process, here is a quote from Campbell Stuart, one of the instigators of our current democratic structure. “In 2004 the Roulant became a Membership organization. The virtues of this model are apparent all around us. Our Members – composed of all current volunteers, clients, employees and donors – have assumed responsibility for the well-being of the organization and the faithful execution of its mission. As Members, they are consulted on major issues, elect the board in lively contested elections, and run for election themselves in large numbers. Without them we have no real elections, no vigorous debate, and no renewal. I would like to buy organic meat and vegetables? I really enjoyed greeting guests as they entered tge gala last year! It was a fantastic event & I look firward to doing tge same tSk this year next Thurs. However, I do not see any info on the website for the Oct. 27th gala! I would like to send an invitation to someone who might be interested in donating or even sponsoring (if his company would be featured as such on the invite, poster displayed at the event, etc. Hi Andrea, thanks for your message and support! The official invitation to the gala is here: http://santropolroulant.org/en/2016/09/official-invitation-to-enchanted-garden-gala/ I will send you an email to chat more about your friend! That’s great! Love what you guys do. Hi Larry, thanks for the wonderful words! There are lots of ways you can be a part of the community! Check out our volunteering page to see what makes sense for you.